The roots, barks, leaves and budding fruits has the properties to treat gastroenteritis, diarrhea, and dysentery. Crushed fresh leaves are used to treat open wounds and skin ulcers. The leaf decoction is taken as treatment for coughs, sore throats and chest ailments. It is also gargled to relieve mouth sores, inflamed and bleeding gums. Guava leaves are chewed to relieve toothache, to cure bleeding gums and treat halitosis. The extracts from guava bark and leaves have shown to have a vitro toxic action against numerous bacteria. 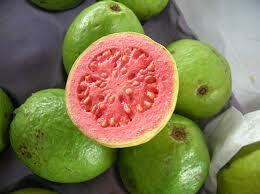 The leaves of guava are rich in flavonoids which have demonstrated anti bacterial activity. This anti bacterial property of guava leaves in what causes benefit to the teeth and gums. 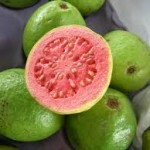 Guava is known to be a good source of vitamins C more than that of an orange or citrus. It is also rich in potassium, calcium and iron. It also contains carotenoids and polyphenols both anti oxidants, giving an edge in high dietary antioxidant value among plant foods. Guavas that are red and orange in color have more potential value as anti oxidant sources than yellowish green ones. In the recipe department, there are innumerable recipes for utilizing guavas in pies, cakes, puddings, sauce, ice cream, jam, relish and other products. Dehydrated guavas may be reduced to powder which can be used to flavor ice cream, confections, fruit juices or boiler with sugar to make jelly or utilized as pectin to make jelly.